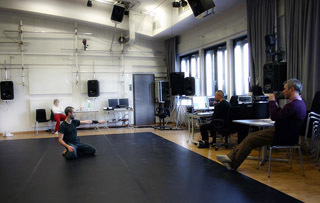 Combination of (1) phenomenological approach (creating affordances for intermedial embodiment phenomena in performance) and reflection, with (2) qualitative research (observation, group discussion, joint analyses of recorded materials), with (3) artistic research (dance improvisation, composition model design with adaptation during exploratory performance sessions). 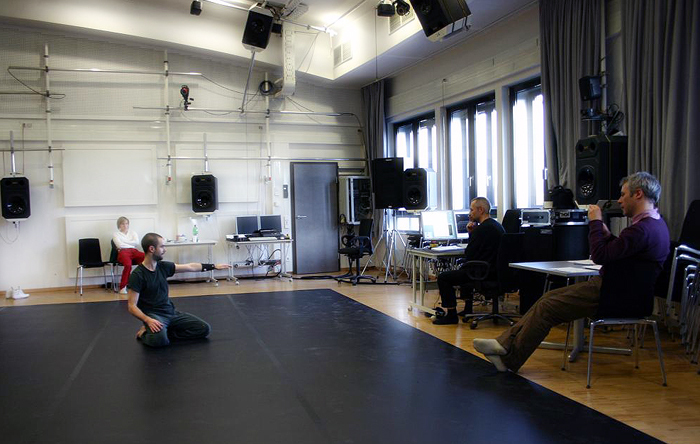 Dancers’ exploration strategy: improvising within a scenario, the goal is to find, locate, repeat and isolate gestures marked by intermedial embodiment. The latter process is now understood as a process of enacting intermedial gestures [see Peters, 2010]. This exploratory stage already involves group discussions between dancer-choreographers, music philosopher and composers. Found and collectively discussed gestures are then choreographically composed into larger coherent units; resulting sequences are rehearsed and ‘fixed’ for presentation and discussion purposes. The philosophical engagement (i.e., aesthetic reflection) with concepts marking the dancers’ and observers’ intermedial experience reciprocally informs the furthering of scenario design and of performative engagement (i.e., performative loop). We used three research modes: embodiment-oriented explorations, ideokinetic enhancement, and large scale performance-oriented.